Las Vegas — Reality or Promoter’s Illusion? Las Vegas rode into the 20th century on a horse-drawn wagon and left in a golden chariot. 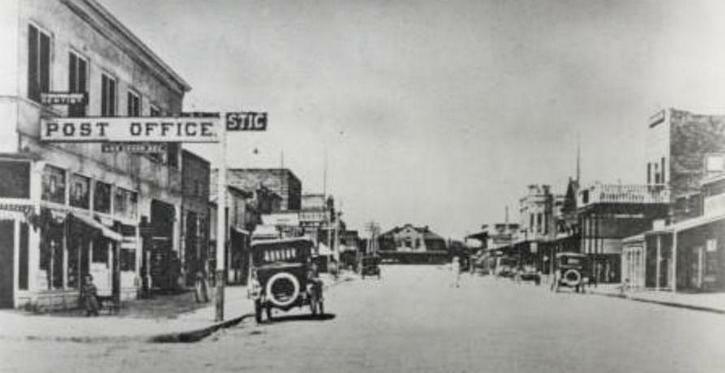 Fremont Street about 1915, with the he original Union Pacific Railroad Station on Main Street at center. 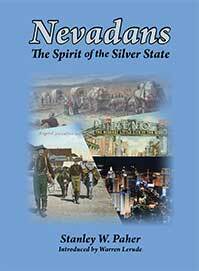 After spending seven months late in 2013 and early 2014 writing more than half of “Nevadans: The Spirit of the Silver State,” it was apparent that I would not finish the project by the time of Nevada’s 150th birthday on October 31, 2014. And so I enlisted 26 others to write various sections of the book which would have been time consuming for me to research and write. Many of the contributors needed extensive rewriting and even additional research to round out their stories, but in the case of Myram Borders her submission was near perfect. She wrote with authority and liveliness about how Las Vegas promoted itself from the time of its founding in 1905 right up to the Sesquicentennial year, 2014. You will enjoy her story; it is the best section in the book. From its beginnings as a brief water stop for travelers, Las Vegas after 1905 grew from a ranch and western railroad town to a sophisticated metropolis known worldwide for posh gambling casinos, five-star hotels, first class shopping, gourmet dining, un­equaled entertainment and un­a­bash­ed night life. Talented pro­moters — with the help of fate and circumstances — led the march to success. But the foundation for modern Las Vegas had been laid a few generations earlier. Las Vegas Valley’s first big chance came in May 1905 when railroad barons, who routed trains through Las Vegas to take on a supply of water and ice, released 110 acres of land for auction. Las Vegas was founded. Business sprang up from the sagebrush and little houses were built on the main street — named Fremont Street — and on adjacent blocks. Homegrown promoters, like newspaper publisher “Pop” Squires of the Las Vegas Age and others, imagined a great future for their town of 800 when it was incorporated in 1911. Little did they know what was to come. Another milestone occurred two decades later when Boulder (Hoover) Dam was under construction on the Colorado River 35 miles away and when easy six-week divorce and legalized gaming became law in 1931. At the beginning of World War II, the Army Air Corps established a base northeast of Las Vegas. By 1950, development of the Nevada Test Site began in a remote area the size of Rhode Island 100 miles northwest of Las Vegas, at the site where the U.S. Atomic Energy Commission tested atomic and thermonuclear bombs during the Cold War. Then came the construction of the nation’s coast-to-coast interstate freeway system linking travelers from the east, west, north, and south to Las Vegas. With each of these developments came a new surge of growth brought about by a new breed of investors and promoters, all striving to convert a desert wasteland into a fun-filled pleasure spa where Lady Luck reigned as a queen. Before zip codes were instituted in 1963, mail addressed to Las Vegas, Nevada, might be delivered to Las Vegas, New Mexico, by mistake. However, by the end of the century, Las Vegas was among the nation’s fastest-growing cities. Las Vegas’ initial boom occurred during the construction of Boulder Dam, later renamed Hoover Dam, during the early 1930s. Thousands of ordinary men seeking work during the Great Depression coveted the grueling and dangerous work in near-fatal heat. Tent towns sprang up for workers, their families and camp followers. The largest of the stark desert communities eventually became Boulder City. On days off, the rough and tumble workers flocked to nearby Las Vegas where newly opened legal casinos on Fremont Street offered chances to test their luck. Early businessmen knew their customers. Cheap food and drinks and a red light district were available, as well as the excitement of casino games. Promoters knew that Boulder Dam was a moneymaker for Las Vegas, not only during construction but also after President Franklin Roosevelt dedicated the dam in 1935. One of the early downtown casinos, the Boulder Club, featured one of Las Vegas’ first kinetic signs. It depicted the new dam with water gushing through overflow diversion tunnels into the Colorado River. The colorful sign attracted sightseers, gamblers, proud residents, and dam construction workers who loved showing it off to visitors. The dam also became a magnet for tourism. At a time when gambling was a questionable and tainted activity in most of the country, Las Vegas promoters now owned an engineering wonder in its own backyard. With boating and fishing at Lake Mead, the entire family could visit Las Vegas in good conscience. Many of the construction workers permanently settled in Las Vegas and Boulder City. They had reached for the brass ring in southern Nevada’s infant days and hung on for the ride which would determine their future for life. When gambling was legalized in Nevada about the time construction began on Hoover Dam, the coin of the realm was the silver dollar. Casino workers were seen dragging down Fremont Street cumbersome canvas bags filled with coins to be deposited in a nearby bank. With silver dollars various jewelers made money clips, place mats, tie clips, and tourists scooped up the coin to take home as souvenirs. When gambling was legalized in Nevada in 1931, the Las Vegas promotion machine started small with a down-home flavor. An early promotional photo showed dusty looking miners and cowboys seated in a downtown bar giving a donkey a drink of beer. The Old West theme prevailed for nearly a half century. 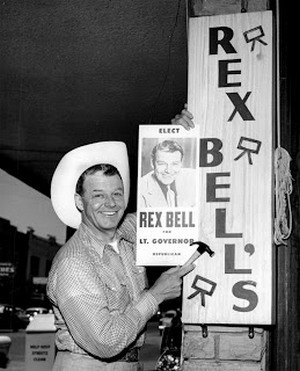 Rex Bell, Hollywood cowboy actor, owner of Rex Bell’s Western wear store on Fremont Street, and Lieutenant Governor of Nevada from 1955 to 1959. Routinely wearing Western attire, Las Vegans often hailed each other with “Howdy Podner” when passing on Fremont Street. Promoters planted that phrase in the mouth of a talking downtown Las Vegas sign. Vegas Vic depicted a neon lighted cowboy moving his arm with a cigarette in his hand and uttering “Howdy Podner” in a booming voice, as smoke oozed from his mouth into the desert air. The two-story sign remains an icon in the modern Fremont Street Experience, but the voice was hushed decades ago and the smoke is long gone. With the help of the Elks Lodge and support of community leaders and businesses, local promoters launched the annual Helldorado Days in 1934. It was a western celebration and the brain child of an Arizona carnival barker who figured he could make money while entertaining Boulder Dam workers in their off time. Soon, the Elks Lodge took over the three-day long celebration. It imported Western movie stars like Dale Evans and Roy Rogers, riding his famous horse Trigger, to serve as parade marshals. Retail stores cropped up along Fremont Street featuring Western attire, including an outfit named after cowboy star Rex Bell. The first Las Vegas hotels fronting the Los Angeles highway — the genesis of the Las Vegas Strip — bore western names such as the El Rancho Vegas and the Last Frontier. Tourists arriving at the town’s small airport, now McCarran International, stepped onto the tarmac, strolled past an outdoor western hitching post into the terminal, and were greeted by a rhinestone cowboy. He herded them into his horse-drawn stagecoach for a ride to a newly built hotel-casino. Every one of them hired marketing and public relations specialists and promoters. The gaming industry, competing to lure customers to individual properties, pulled together in a unified attempt to expand the magic in the name Las Vegas. The Las Vegas Chamber of Commerce became a powerful lobbying arm always pushing government elected officials to open new avenues of opportunity for Las Vegas while keeping the federal government at bay when legalized gambling might be threatened. To promote Las Vegas, Maxwell Kelch founded the Las Vegas News Bureau in 1949. It was jointly financed by the resort hotels and served as a 24-hour photo mill for Las Vegas promoters and publicists. Photographers captured movie star weddings, superstar shows and antics, swimming pool beauties, sport tournaments, auto racing events, rodeos, beauty pageants, and even mom and pop visitors from middle America. The photos were distributed nationwide and ulti­mately worldwide to promote Las Vegas. It worked. The motto of the realm was work hard, live fast, make money, challenge Lady Luck regularly, and have fun. The unofficial Las Vegas mascot was a tall, shapely, skimpily clad showgirl wearing a halo of feathers. Showgirls not only routinely exhibited musical and dancing talent on the stages of Las Vegas resort hotels, but also in the 21st century they strolled along Fremont Street nightly to the delight of tourists. Eye-popping showgirls routinely on each arm of the mayor or accompanied by hotel sales and marketing teams are familiar images domestically and internationally. When Las Vegas was beginning to think about attracting tourists, Japan bombed Pearl Harbor on December 7, 1941. Until that infamous day few people took note of the insignificant Army Air Forces runways on the outskirts of Las Vegas. The war fed Las Vegas’ growth as well as the promotion of the city’s name. The military rushed personnel into the area to protect Hoover Dam. Machine gun bunkers were built near the new engineering wonder, which supplied electricity to California’s war materials factories and aviation companies. The nearby Army Air Forces airfield and gunnery school mushroomed into Nellis Air Force Base, home to the nation’s greatest aerial fighter squadrons. Thousands of military personnel poured into the Las Vegas area. When the war ended hundreds made Nevada their home. As Las Vegas grew in military importance and military personnel, Strip hotels and Las Vegas promoters set their sights on new business opportunities. 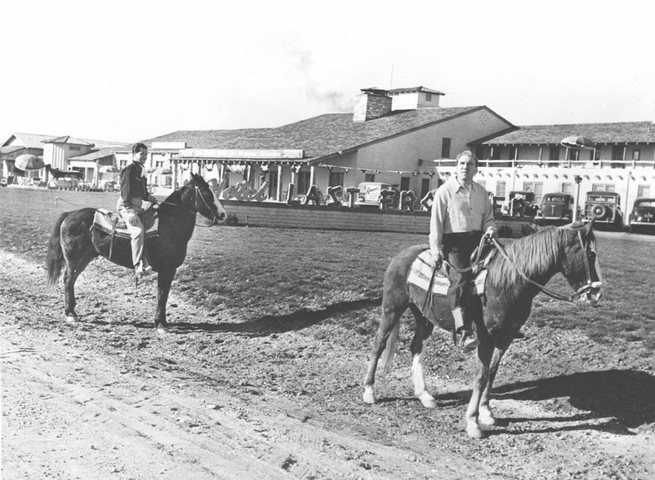 El Rancho Vegas, the first resort hotel and casino on the Strip, in July of 1942. Many stars who entertained the troops in war zones, including Tommy Dorsey and his band, also appeared on the Las Vegas Strip. Las Vegas promoters touted the city’s patriotism. Entertainers raised funds in war bond drives. Las Vegas was becoming an entertainment magnet — both for performers on stage and for movie greats seeking a respite from Hollywood. If ever there was a question that little-known Las Vegas was destined for stardom, the answer came when a contingent of newspaper reporters suddenly converged on the city in 1942. Movie star Clark Gable, the lead in Gone with the Wind and the biggest box office draw in the nation, was in Las Vegas awaiting word about his wife Carol Lombard. Her TWA flight had crashed into the Potosi Range thirty miles west of Las Vegas as she flew home to California after a war bond tour in the East. Local promoters pulled out all stops to entertain the national media Las Vegas-style while they kept an eye on Gable, who awaited word on the fate of his wife. Betty Grable, the World War II pinup girl, and her husband, bandleader Harry James, moved to Las Vegas, and also entertained on the Strip. Liberace built an outlandish mansion. Phyllis McGuire of McGuire Sisters fame, built a home in Rancho Circle, Las Vegas’ elite address at the time. The dusty Western cowboy town was transforming into “The Entertainment Capital of the World,” a motto promoters effectively spread worldwide. After World War II ended, the Cold War began and Las Vegas again was in the spotlight. It marked the dawn of the atomic age with the United States and the Soviet Union in a deadly arms race. The psychedelic colors of atomic bomb mushroom clouds painted the early morning sky of Las Vegas beginning in 1951. Promoters didn’t miss the opportunity to link the city to the bomb. “Miss Atomic Bomb,” Las Vegas showgirl Lee A. Merlin. Photo by Don English, Las News Bureau, 1957. A showgirl photographed in a cloud-like swimsuit shaped like a mushroom was named Miss Atomic Bomb. The picture circulated around the world. An Atomic liquor store opened in downtown and local bars served “atomic” cocktails. Las Vegas profited as the arms race gained momentum. Newsmen from throughout the world converged on Las Vegas to cover the atomic bomb blasts. Photos of mushroom clouds on the city’s skyline were printed worldwide. The flash from atomic blasts were seen in some California cities and people traveled to Las Vegas to get a closer look. The testing program became a tourist attraction for Las Vegas. Newsmen assigned to cover the atomic bomb story got exceptional treatment from Las Vegas hotel and casino owners. As a result, national and international news reporters not only covered nuclear tests, but also wrote about Las Vegas as the gambling and Entertainment Capital of the World. Promoters and resort public relations professionals again succeeded. They charmed the working media and turned almost a decade of atmospheric testing into a tourist attraction for Las Vegas. For 45 years after 1931, Nevada was the nation’s only state with full-blown legalized gambling and wide open casinos. As early as the 1940s the FBI and IRS trained a watchful eye on the state’s primary industry when they suspected money was siphoned from Las Vegas casinos into the coffers of organized crime, especially in Chicago, Florida, Cleveland, and Kansas City. Unsavory characters coalesced around Las Vegas, and in some cases they owned hotels. Benjamin “Bugsy” Siegel built the Flamingo Hotel on the Las Vegas Strip in December 1946. Morris (Mo) Dalitz, an alumnus of the Cleveland Syndicate, owned the Desert Inn from 1950 until 1967 and briefly controlled the Stardust. More than once he was honored as Las Vegas Man of the Year, Frank “Lefty” Rosenthal was a well known odds maker and professional gambler who escaped death in a car bombing not far from his home in the Las Vegas Country Club. From the beginning, tainted money built many of the lavish resorts that lined the Las Vegas Strip. The Teamsters pension fund, headed by Jimmy Hoffa, the Culinary Union pension fund, and money from hidden owners flooded Las Vegas. A cut of the casino proceeds was funneled to organized crime bosses outside of Nevada. 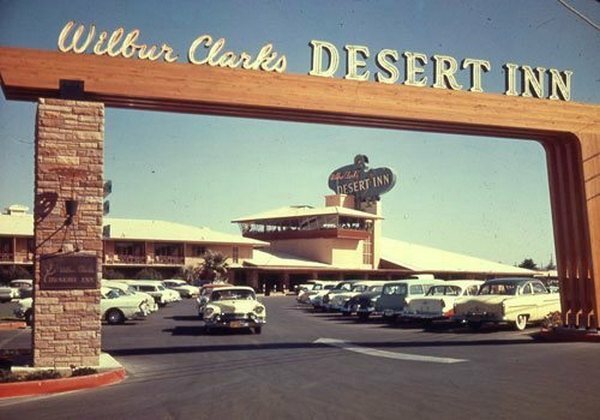 Mob built and owned hotel-casinos on the Strip typically had nominal owners without criminal records as “front men.” Thus, the Desert Inn was “Wilbur Clark’s,” rather than “retired” Ohio mobster “Mo” Dalitz’s . The classic movies The Godfather and Casino fed the public’s desire to know more. Even after gambling was legalized in New Jersey and other states and Indian casinos opened throughout the nation, the public continues to be mesmerized by the Las Vegas connection to organized crime. Promoters scored again when the multi-million dollar “Mob Museum” opened, appropriately, on February 14, 2012, the anniversary of Chicago’s St. Valentine’s Day massacre in 1929. Officially known as the National Museum of Organized Crime and Law Enforcement, the museum authentically chronicles the history of organized crime and its impact on Las Vegas, as well as the valuable prevention work of law enforcement. The museum is housed in the former federal courthouse and post office, originally built in 1933. Its centerpiece is the second floor courtroom where, ironically, in 1950-51 the Senate’s Kefauver Committee held hearings to expose organized crime. Exhibits focus on mob violence, casino skimming operations, and law enforcement wiretapping. A still from Martin Scorsese’s 1995 film about organized crime in 1970s Las Vegas, Casino, features the spectacular view of Fremont Street from the Center Stage Restaurant in the Plaza Hotel and Casino, built on the site of the old Union Pacific Station at 1 Main Street. Stars Sharon Stone and Robert De Niro are seated at the table at center right. The advertising slogan “What Happens in Vegas, Stays in Vegas” was a stroke of genius and a perfect fit for the wide-open lifestyle sought by many tourists. It was the brainstorm of R&R Advertising, the premier agency which promotes Las Vegas. They had hit a home run. Year after year the slogan continues to surface on national television. Las Vegas resorts hire some of the world’s highest paid advertising, marketing and public relations agencies to keep its name front and center on the world stage. Their job is to attract visitors from throughout the world to fill casinos, showrooms, restaurants, shopping centers, hotel beach parties, the vast array of nightclubs, and the ever-expanding inventory of hotel rooms. Las Vegas has more hotel rooms than anywhere else in the world. Salesmen for the Las Vegas Convention and Visitors Authority (LVCVA) and individual hotels work endlessly to attract hundreds of conventions to Las Vegas annually. Las Vegas Special Events, an arm of the LVCVA, pays millions each year to retain the National Finals Rodeo in Las Vegas. Promoters fill Las Vegas’ arenas year-round with professional boxing, golf, wrestling, basketball, baseball, or hockey events. Marketing teams from hotels and government tourism agencies travel the world to attract international travelers to Las Vegas. As a result, thousands of visitors fly to Las Vegas from Mexico to celebrate Cinco de Mayo. Chinese New Years is celebrated with dragon dances, fireworks and elaborate floral decorations in Las Vegas Strip hotels. New hotels, sporting arenas, shopping meccas, and other attractions continue to open. There appears to be no limit in sight for the small western railroad town that morphed into the world’s most famous playground. For more information about Stan Paher’s excellent Sesquicentennial book, or to buy a copy, click here.